also is the amount of struggle and toil required to achieve it. 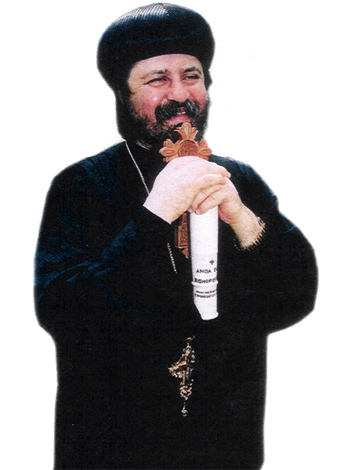 In this little pamphlet, I want to share with you the happiness of this great memory in the life of the parish of St. Mary, St. Bakhomios and St. Shenouda Coptic Orthodox Church and Community Centre. 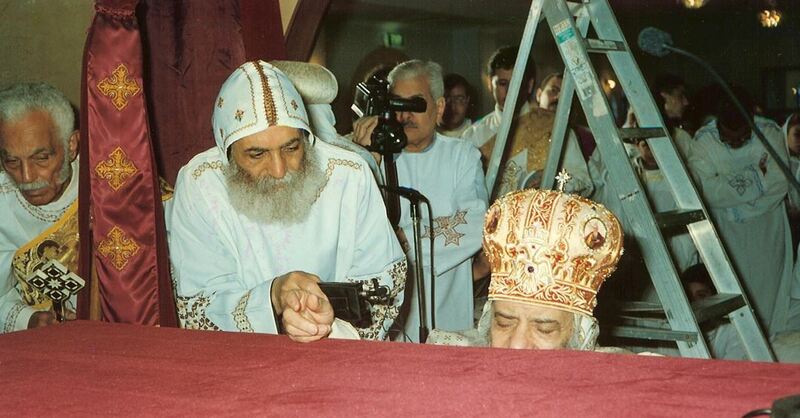 This year 2006 highlights the fifteenth anniversary for establishing this parish in the Sutherland shire and the tenth anniversary for consecrating the main Church of the parish by the blessed hands of his holiness Pope Shenouda III, Pope and Patriarch of the Coptic Orthodox Church worldwide. 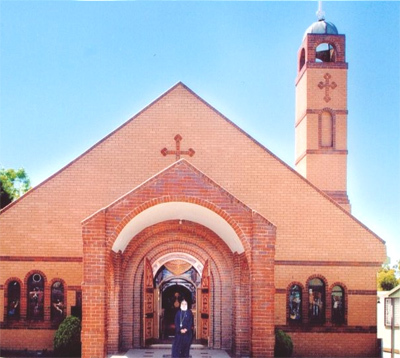 I would like to highlight here also that this is the first Church worldwide that has been on built by the name of St. Bakhomios – father of Community outside Egypt; and it’s main alter (the middle alter) is the first alter in Australia to be consecrated by the name of St. Mary. 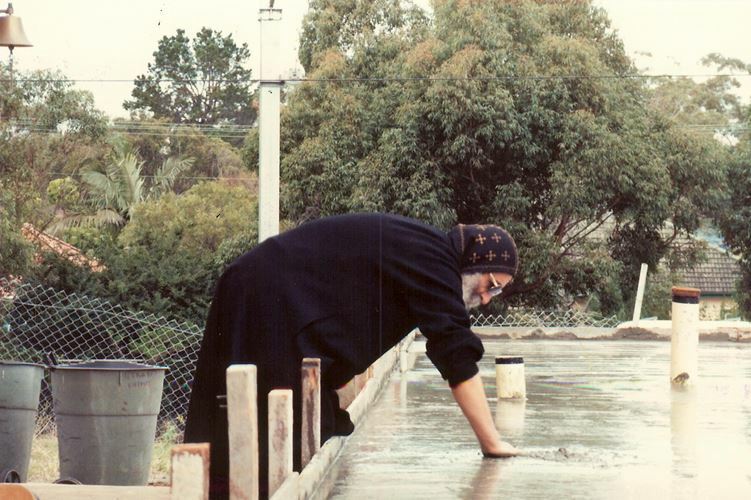 Here I will very briefly tell a little from a long story of struggle and effort to establish the parish of St. Mary, St. Bakhomios and St. Shenouda, Kirrawee at the heart of the Sutherland shire and the steps from the beginning where there was nothing up to the moment of this pamphlet; with what you see in this parish, it s buildings and the different services conducted by the parish. Mentioning this, gives the greatest glory to the Lord our God, Who supported us with His Mighty Hand to achieve this great project. The monthly memorial feast of the three Lordly feasts – Annunciation, birth of Christ and Resurrection. Martyrdom of Pope Peter the Seal of Martyrs, martyrdom of Bishop Clement of Rome and Martyrdom of St. Catherine. 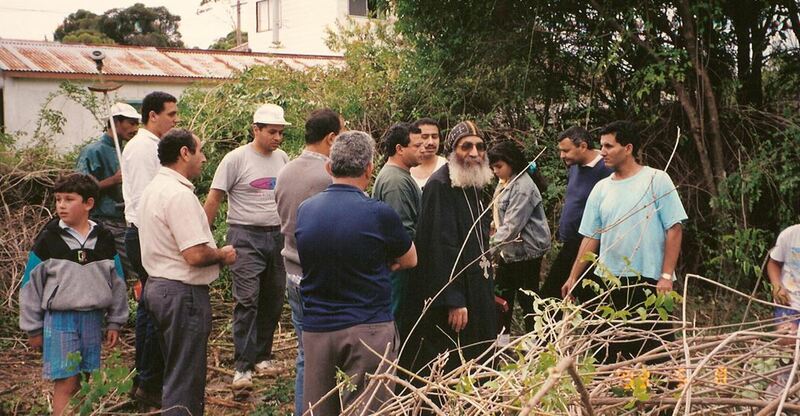 There appeared a need in 1989 for establishing a Coptic Orthodox Church in the Sutherland Shire, as the Coptic families residing in the Shire were increasing; this increase covered most of the Shire suburbs up to Wollongong. Rev. Fr. Tadros El-Bakhoumi to be in charge of this project. At this moment there were no determined congregation for the new parish and there was no place what so ever to be used. Struggling Step by Step to Achieve. We started by renting the activity hall of Sylvania high school at Bellingara Rd Sylvania (June 1991). We were permitted to use the hall from 7:00PM Friday evening till 1:00PM Sunday afternoon. During this period of time, we could accommodate youth meetings on Friday night, vespers and midnight praises on Saturday evening and the Holy Mass and Sunday school service for the children on Sunday morning. Every single week we used to carry all our requirements and put them up so that the hall looks close to a Church environment then take it off again after use. As we felt the great need for many prayers for the success of the project, we felt a need of praying at least another Holy Mass every week. The only place which was available for this was at the lounge area of the residential flat of Fr. Tadros to pray an early morning Mass between 5-7AM every Thursday to as much number of people the lounge could fit. To our surprise, the people’s attendance for the first Sunday Mass was many so that the schools activity hall was filled. Later on (the 25/09/91), we were able to rent the Church hall of St. Mark’s Anglican Church Sylvania. We received the keys on Friday evening 25/09/91 and we worked very hard (almost all of Friday night and all of Saturday) to convert the Anglican Church hall to as much as possible a Coptic Orthodox Church (building temporary Iconstasis, alter, putting curtains, icons …etc). 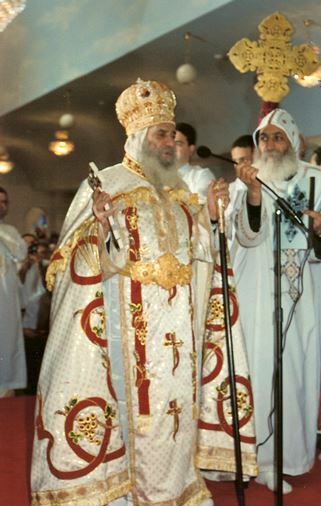 By 2:00AM Sunday morning (the 27/09/91), the hall was ready as a Coptic Church for the Holy Mass at 7AM Sunday morning. Research for a Permanent Site. It was not an easy task to find the appropriate location required for our needs and for future extensions. It took us the rest of Year 1991 and the whole of year 1992 to save money from the little donations of the congregation and also to search for the proper location. We looked at thirty two sites but none of them was what we exactly needed. The location we are in now at Kirrawee was found by a miraculous way. It wasn’t through a real Estate, but Fr. Tadros was shocked with a phone call from the owner saying, “We are aware that you are looking for a land to build your Church, we have a site you can come and inspect”. That was it! – A blessing from the Lord our God. 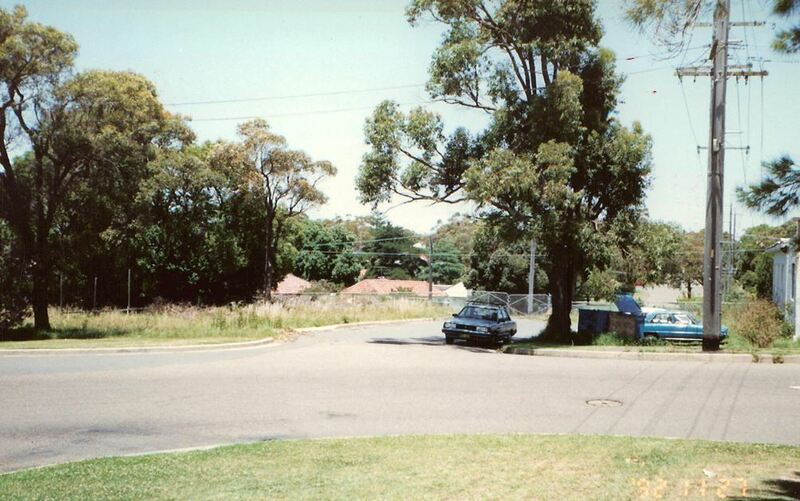 The purchase of the land (our current site 168 Bath Rd, Kirrawee) was finalised in January 1993. Beginning of the Work on our Permanent Location. We started the process of developing plans to be prepared and submitted to the Sutherland Shire council, while we were still using the rented Church hall of St. Mark Anglican for the required services. Beginning of April 1993, they requested us to vacate the Church hall as they wanted to rent it for a dancing school to use. It was very hard to move again to a rented place but thank God, we were able to rent a factory hall (3 Flora St. Kirrawee), which was just across the road from our permanent purchased land. 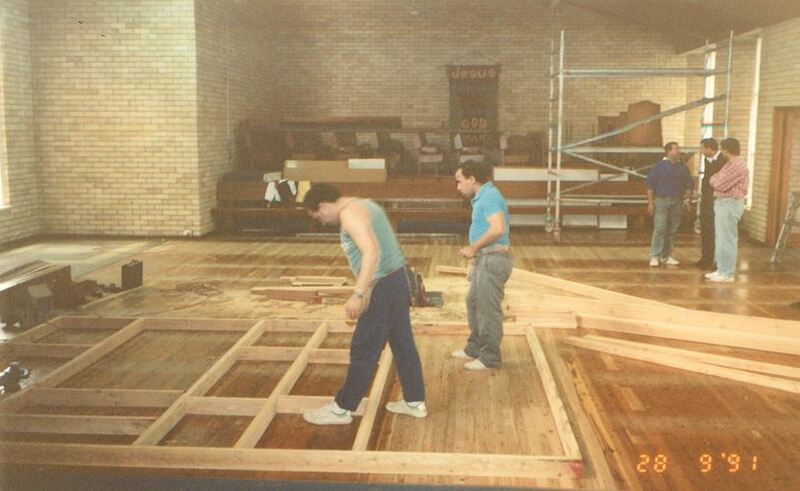 The same process of working very hard to convert the factory hall to a Coptic Orthodox style and moving the furniture took place again and we had the first Sunday Mass in the factory hall 15/04/1993. We got the building approval from the council in July 1993 and this was a miracle in itself as the mayor at that time (councilor Ian Swords) said in his speech during the ceremony of opening the first building, that this approval came from above and not our own. First Building in the Parish (the Ancillary Service Building). The parcel of land we bought was a totally neglected bush area, which required a lot of hard work. I here put special thanks for the members of the congregation at that time, who worked very hard wholeheartedly to clean the site and also help in the building process. All of us were aiming to save every single cent possible with our volunteer work, according to our limited financial resources. 3. A library hall in the first floor with all it’s amenities in time. His Holiness visited the site, blessed the new building with sprinkling water and the foundation stone for the new Church was laid. Important Dates for the Parish. First youth meeting 14/06/91 – Sylvania high school activity hall. First Sunday Liturgy 16/06/91 – Sylvania High School. First early Mass 5-7AM Thursday 18/07/91 – Fr. Tadros’ lounge room. Moving to St. Mark’s Anglican Church – Friday 25/09/91, 7PM. First Sunday Mass at St. Mark’s Anglican – 27/09/91 (the feast of the ‘Holy Cross’). Purchase of permanent land – 168 Bath Rd Kirrawee 1993; January 1993. Rent of factory land (3 Flora St. Kirrawee) – 3PM Fri 13/04/93. 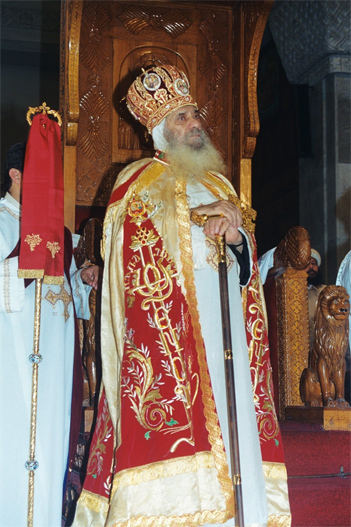 First Sunday Liturgy at the factory hall – 15/04/1993. First building approved by Sutherland council – July 1993. Blessing the first building and laying the foundation stone for the main Church – September 1993. First Liturgy at the new building hall – 168 Bath Rd Kirrawee 03/11/93. It required a period of time to recover from the very hard work of the last mentioned steps and also to recover financially, to be ready to build the main Church of the parish. In January 1996, we decided to start preparing the plans of the main Church to submit it to the council for approval. Pushing things hard in preparing the land, digging for the foundation with many obstacles arising at that time but thank God by July 1996, the foundations were laid and the concrete slab was poured. At Mid July the same year, we received information that his holiness will be visiting Australia early December that year. 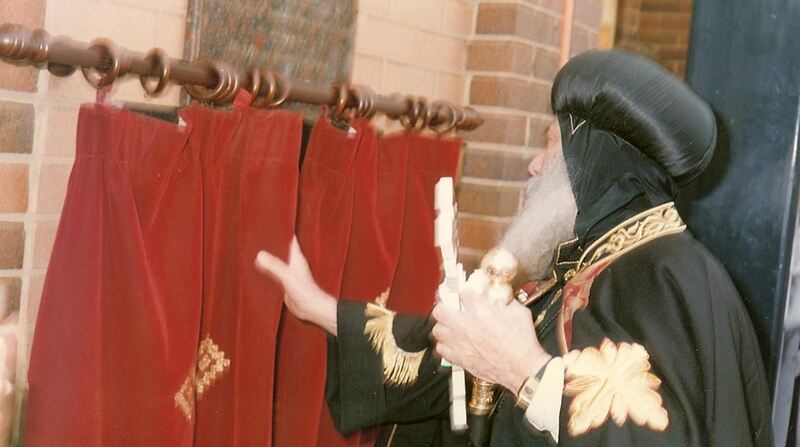 We found this a great opportunity for him to consecrate our Church and also so that he consecrates the main alter by the name of St. Mary the mother of God – to be the first for the whole of the Coptic Orthodox Churches in Australia. But logic study will tell that the amount of work required from just the slab concrete, to the big whole Church to be built, finished and furnished is impossible to be complete in four and a half months. At this moment I said to the congregation, let us all firstly pray very hard and secondly put hands together and work very hard and I’m confident that the Lord will help us achieve this goal. It happened so and we worked very hard almost day and night in spite of the terrible weather conditions in winter. 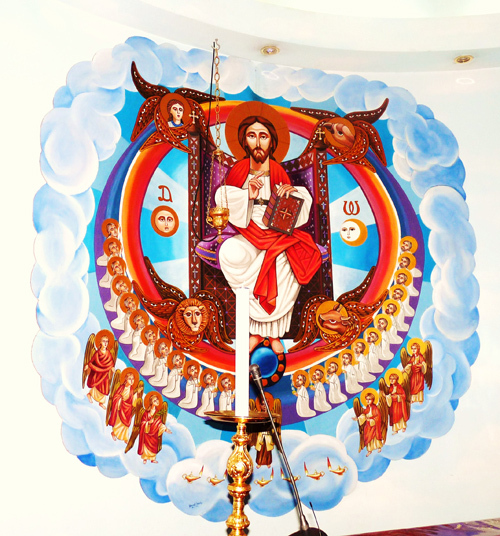 It was a real shock and amazement to everyone that the last thing to be completed in the Church was fitting the big icon on the main wall of the Sanctuary after a continuous day and night work over the last week. This was finished forty five minutes before the arrival of His Holiness on 8th December so that he opens and consecrates the Church. and the baptism of the Church. He also baptized many children whose parents have been awaiting this happy occasion – to baptize their children. His Holiness admired very much the whole internal and external building of the Church and he commented that it was one of the most beautiful Churches he has seen in his international movement around the world. He also commented that this Church is built on an absolute correct ritual order of the original old Coptic style, but in a very decent modern finish. 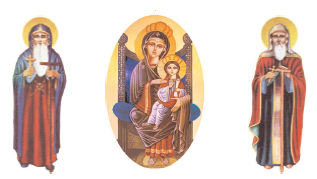 His holiness also commented on the icons – how they have been painted and coloured with a true Coptic style but with a life finish. His holiness also admired very much the baptism that can baptize both children and adults with full emersion and very smartly designed to have the two into one. By the end of the consecration of the Church, his holiness gave a speech congratulating the congregation for the beautiful Church they have and he presented gifts for those who worked hard in the building and also took photos with the families that painted the icons. expressing his great admiration. He left bishop Moussa to pray the Holy Mass with the congregation as his holiness had to go to another Church to consecrate it’s alters. Architectural Design of the church. The Church is built on the true original Coptic Style of Church buildings. The main design of building a Coptic Church from the Coptic rituals is either in the shape of – a cross, a ship or a circle. This Church is built on the shape of a ship with a big main vault on the length of the Church from east to west and is directed towards the east, according to the Biblical understanding (this is one of the main reasons which took us long to find a proper parcel of land to build the Church towards the east). 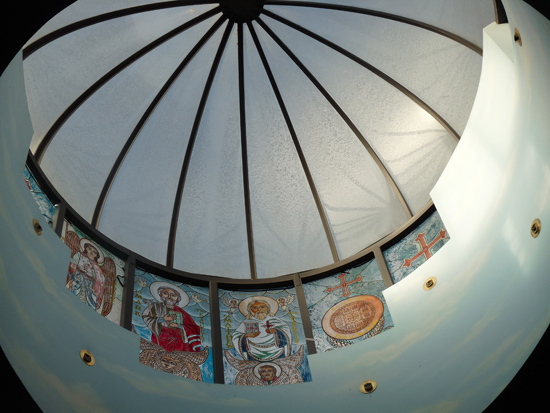 In the middle of the vault, there is a big dome made of Perspex to give the people the feeling of the open sky lifting our hearts and understanding to Heaven, with icons placed in a certain order around the dome according to the ritual of the Church. To the far east of the Church, there are three sanctuaries – two small side nes with two small domes on its top and the middle main sanctuary with a big dome on its top. The entire middle big vault for the whole length of the Church and the big dome on the middle sanctuary and the two small domes on the two side sanctuaries; are painted with a very light sky blue with a cloud effect, giving the impression of Heaven to the believers, while praying inside the Church. To the far west of the church on the northern side, there is the baptism room with two doors according to the rituals of the Church and on the Southern side; there is a room with a big window towards the east. Inside this room the mothers with infants attend the prayer and can watch and hear everything, while keeping the Church quiet from the children’s cry. In the area behind the sanctuary towards the east, there are two lecterns placed according to the Church rituals; a place for the deacons serving the Church and on the northern and southern sides of the Church, there is a door in the middle of which, according to the rituals of the Church there are also on the northern and southern sides, apartments containing relics of martyrs and saints. The iconostasis of the church is made from special dovetailed timber, which always had been used in the very old Churches of the very old monasteries (from the third and fourth centuries) and this was specially imported from Egypt. All around the Church – northern, southern and western sides, there are forty two windows of leadlight glass made at St. Demiana convent in Egypt and fitted in order of the rituals of the Church. New projects of the Parish. With the grace of God, and support from the Church congregation, we were able to buy three properties next to the Church (166 Bath Rd, 164 Bath Rd, and 24 Clements Pde). 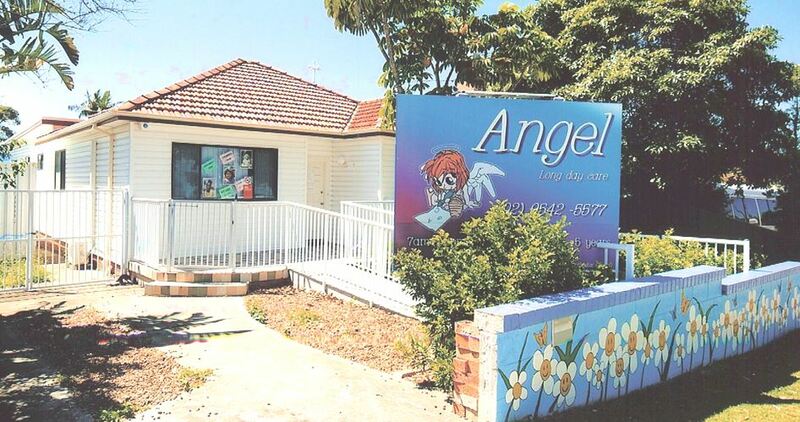 The first one of them was reconstructed to be a childcare centre (with the name of ‘Angel Long Day Child Care Centre’) and the other two are rented as an investment until time comes for future projects. Let us all lift our hands in thanksgiving to our Lord for the blessing that we had with His Mighty Arm, working with us until the achievement of what we explained above. Let us also together lift our hands in prayer for the Lord to complete His work with us and the services in this parish to grow more and more for the salvation of souls and the glory of our Lord’s Holy Name. Pray for us; God be with you all. St. Mary, st. Bakhomios and st. Shenouda Coptic Orthodox Church and Community Centre.